I drink my black tea black. Often, I drink my black tea with others, and some of them drink their black tea white. In fact, afternoon tea opens up myriad possibilities. Sometimes, I might try a particular black tea white. Sometimes, my friends who normally drink their black tea white might try one black. Of course, sometimes we are not drinking black tea. sometimes we are drinking white tea, which is usually drunk without milk, therefore technically the white tea is ‘black’ or ‘not white’, even though it’s white tea, not black. Sometime we drink green tea, or yellow tea, or oolong. 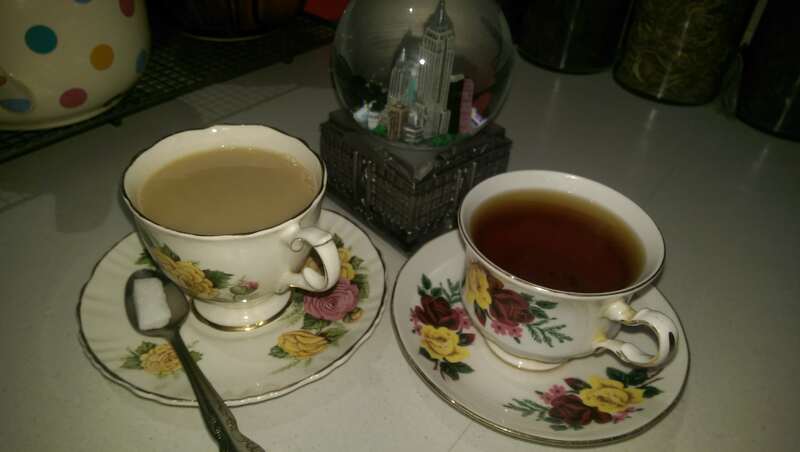 In fact, we drink tea in every hue imaginable. By the time you add bold coloured herbals, like chamomile, rooibos, hibiscus and butterfly pea, the tea table can be a veritable cornucopia of colour. Sadly, at tea time, you will occasionally get someone who eats all the custard creams. Or who puts all the jam on their scone, leaving none for anyone else. Or who, in the course of the discussion, says something hurtful or untrue. When it happens, good Afternoon Tea etiquette is to judge the behaviour of the offender, not the colour of their tea. There is no place for judgement based on colour; we must as a group, insist that everyone gets what they need, no-one takes all the jam and that our lively discussion of today continues tomorrow, once we’ve refilled the custard creams. Dedicated to the memory of Alton Sterling, Philando Castile, the five brave law enforcement officers killed in Dallas, Texas this week, the 200 people in Baghdad killed because of the way they worship and no doubt innumerable others we have lost to hate since my last blog. Thank you. I looked at doing a long and complicated piece, but in the ends it’s a pretty simple concept in theory, even if it’s incredibly difficult in practice. The whole time I had Black or White in my head. This Yankee, who grew up going to school with Arabs of several faiths and was friends with many, loves this post. Thank you. Really nicely said. I enjoyed the article a lot.